I recieved an enquiry last week for a Life Change Holiday and was asked what wildlife could be seen in and around Chiang Mai, so I thought I would dash off a quick article which covers the things that I have seen recently in and around Chiang Mai. I haven’t made it up, but when I read it back it seems unbelievable really and just shows how blasé we (I) can become with regular exposure to unusual things and incredible wild life. This is a bizarre thing. The other night I was walking around our village admiring the view up to the temple in the mountains, when, in front of me, under the light of a street lamp sat a small owl. It had its back to me but I recognized it as an Asian Barred Owlet, a little tiny beautifully dappled owl. I walked right up behind it and stood there. I felt a bit like an emperor penguin about to shuffle its young onto my feet. We stood there together for quite some time. I wondered whether it was sick or had been hit by a car so I made a small noise to see if it would move. It turned around and looked up at me and suddenly outstretched its wings and flew silently away over the rice fields. When I say “giant” it is not an understatement. 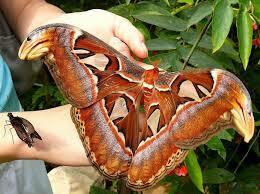 The Atlas moth is huge. It is quite unbelievable. It is in fact the biggest moth in the world and these reclusive nocturnal giants are fairly common around Chiang Mai. I have seen several over the years but the one I saw recently was a whopper. Its wingspan was well over 12 inches or (30 cm for those metric minded amongst us) and it was minding it’s own business beneath the shade of a jack fruit tree in my back garden. These are incredible birds. They look like storks and wheel around in the sky over Chiang Mai in huge flocks. They hardly look like they are moving. When you see them on mass they really are an incredible sight. I usually see them early in the morning on my way to work, slowly wheeling over the wet rice fields. They are supposed to be migratory, slowly moving up and across the country following the food supply and weather patterns although these days vast numbers of them seem to be here all year round. Chipmunks make me laugh. You see them throughout Chiang Mai scurrying along telephone wires and busying themselves chewing through stuff and generally making a nuisance of themselves. The first time I saw an eagle soaring down from the mountains above Chiang Mai and over the western side of the city I couldn’t believe it. They are massive, and the serpent head eagles are the most common that we have around here. They soar high above the city, usually flying in from the surrounding mountains. At night the air is alive with the sound of crickets and croaking frogs. The most amazing of these must be the yellow tree frog, which despite being a tiny little fella makes an incredibly loud noise. I was putting the rubbish out the other night (as you do) and sitting proudly on top of the rubbish bin outside was a bright yellow tree frog croaking loudly away oblivious to my rubbish duties. With smelly bin water dribbling onto my bare feet I shooed it off the lid and it jumped an amazingly high and long distance over my head and into the darkness of our front garden. There is all sorts of wild life and natural history literally on every door step in Chiang Mai and I doubt very much that whether you are here for a week or even a few days that you will return home without seeing something amazing. Check out our Life Change Holiday: Life Coaching Holiday, Counseling Retreat or Couples Therapy Retreat.